BILL 86: The EMSB was scheduled to appear before Parliamentary hearings in Quebec City on February 16 for proposed Bill 86: An Act to modify the organization and governance of school boards at Parliamentary hearings in Quebec City. If passed it will restructure the province’s school boards by limiting the public’s right to vote for school board commissioners. But the EMSB’s date was postponed and it has yet to be rescheduled. The EMSB strongly opposes the proposed legislation. EMSB Chairman Angela Mancini has extended her best wishes to Pierre Moreau, who had to step down as Education Minister due to illness. Sebastien Proulx is the new Minister of Education for primary and secondary schools. The EMSB wishes him well in his new duties and looks forward to meeting with him in person and at hearings. "I would like to share with Proulx that our Board has the highest success rate in the province at 88 percent and we were able to adopt a balanced budget despite the fiscal challenges we face," she said. "If it is not broke, why fix it? This is the question we asked the previous Minister and we will transmit the same message to Mr. Moreau at the hearings.” The EMSB Central Parents’ Committee has also come out against Bill 86. LITERACY INITIATIVE: The January 22 press conference held at Dante Elementary School in St. Léonard to promote the EMSB Literacy Initiative is still gaining a lot of traction in the media. 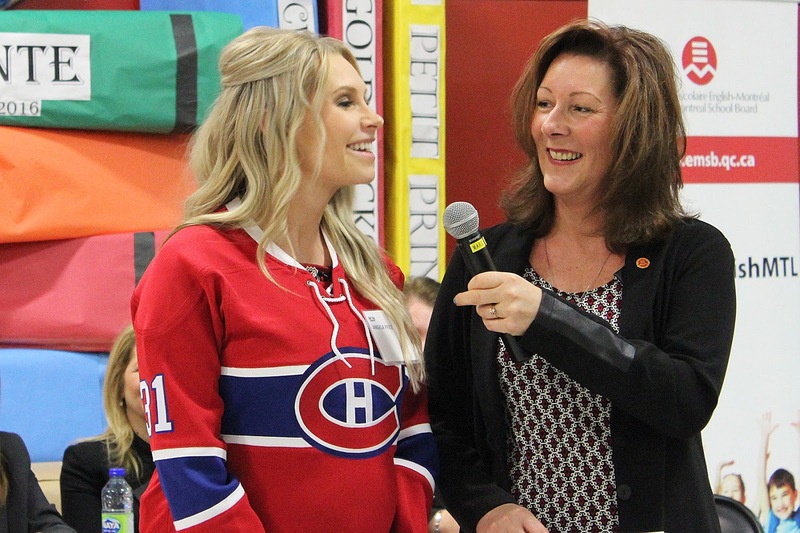 A recent episode of the highly rated program 24CH followed the wives of Carey Price (Angela), Brian Flynn (Alyssa) and Tom Gilbert (Larissa) as they took part in the press event and read books to the children. Here is the English version broadcast on CTV and the French version. HOOKED ON SCHOOL: The sixth edition of Montreal Hooked on School (Journées de la persévérance scolaire) took place February 15 to 19. Martine Legault-Ciccia is the EMSB representative for this program, which focuses on staying in school initiatives. The EMSB has the highest success (graduation) rate (87.9 percent) in the province, meaning it followed the progression of students from 2007 to their graduating year in 2014. This is all the more impressive given the fact the province-wide graduation rate is 77.7 percent. Students and staff at the James Lyng launch. Throughout the year, the organization, which is comprised of 33 partners representing the education, community and business sectors, focuses on scholastic retention, making it a priority at schools throughout the province. Awareness campaigns, such as Hooked on School Week, have allowed students, family and communities alike to understand the value in education. 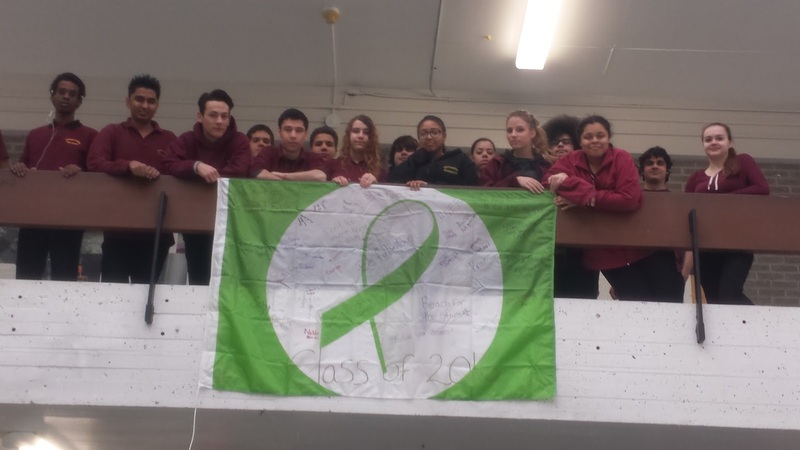 The regional launch for Quebec Hooked on School Week was held at James Lyng High School in St. Henri. Lester B. Pearson High School in Montreal North organized a number of programs and so did other schools. Here are some photos of the Lester B. Pearson HS students playing hockey against the local police. The Lester B. Pearson High School delegation with the flag. Please see this press release for more details. John F. Kennedy High School Principal Joseph Vitantonio was one of the spokespersons for the event. See this video. Here is Martine Legault-Ciccia on Global TV. Here are a series of reports on Breakfast Television from James Lyng. SHARING MUSIC: Artist Jaye, the founder of the Sharing Music Unites Us cause, visited Lester B. Pearson High School in Montreal North recently to spread a message of peace and unity around the world through the gift of sharing music. 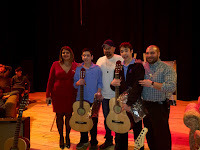 Two Secondary I students, Daniel Chiappini and Carmine Olewinsky (pictured left), were the lucky recipients of acoustic guitars donated by the organization. It was a memorable event for the junior students. Here are some photos and videos. Nancy Drolet showcases her medals. FEMALE HOCKEY STAR: As part of Hooked on School Week activities, St. Dorothy hosted a very special guest who spoke to the students regarding having a dream and staying in school to accomplish it. Nancy Drolet is a Canadian hockey player who has been playing since she was 12 years old. She represented Canada in six world championships and won a silver medal at the 1998 Nagano Olympic Games. During the presentation, the students learned that in the pursuit of achieving their goals, they should always be a team player and never give up. Nancy is such a motivational speaker that not only did she inspire the students, but kept their attention until the very end. 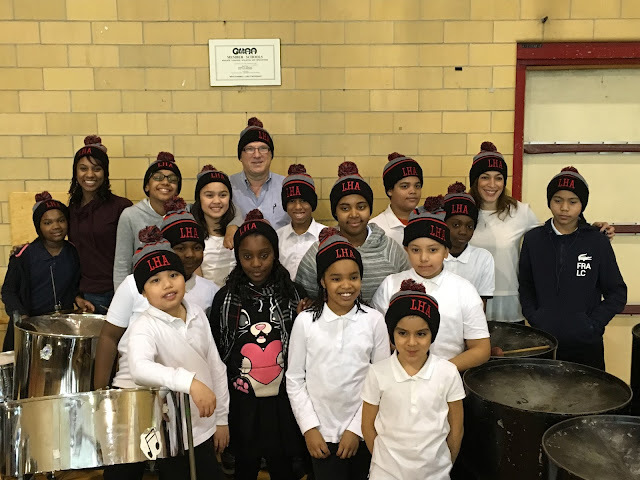 CARNAVAL DE HAMPSTEAD: To celebrate Hooked on School Week, Hampstead Elementary School planned a special week for students in the form of a winter carnival, led by teacher Gaby Darling. 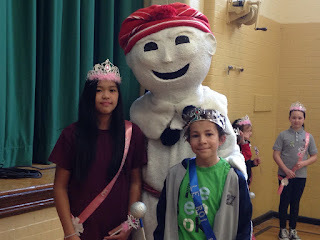 Le Carnaval de Hampstead, inspired by the annual Carnaval de Québec, is a week-long celebration of the French language and culture and school perseverance. Students were encouraged to speak French, participated in outdoor activities like ice castle building and tug-of-war. The Carnaval would not have been complete without an appearance by the Bonhomme Carnaval. The week ended with a closing ceremony that included the crowning of a parade king and queen at each cycle. 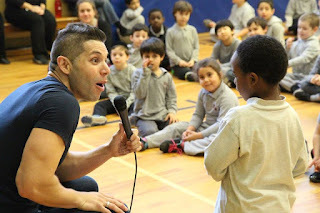 MOTIVATIONAL COMEDIAN: On February 5, Hampstead School was excited to welcome David Edward Garcia (left), voted North America’s number one motivational comedian for the past three years, and the only one who can speak five languages. Students and staff listened and laughed during the hour-long energetic talk about friendship, kindness, and anti-bullying. The presentation was part of Hampstead’s kickoff to Kindness Month. REGIONAL SCIENCE FAIR: The annual Hydro-Québec Montreal Regional Science & Technology Fair will take place Sunday, March 13, through Tuesday, March 15, on the downtown campus of Concordia University. Organized by Educational Alliance for Science & Technology (EAST), this is the second of three consecutive years that the Fair will be hosted at Concordia. During this one-of-a-kind competition, budding scientists aged 13 to 20, will be presenting to visitors scientific projects that bring out passion in them, proving that science and technology can be interesting and accessible.Graham Carr, Concordia’s Vice-President, Research and Graduate Studies, is urging students, teachers and all of those individuals interested in science and technology to bookmark these dates. EMSB students at last year`s Science Fair. “There is no admission charge and so many fabulous projects to see,” said Mr. Carr. “Over the years, our students have gone on to win significant prizes at the provincial, national and international levels.” Come out and support the many EMSB students. CRC ROBOTICS THIS WEEKEND: The 15th annual CRC Robotics Competition, presented by The Educational Alliance for Science & Technology (EAST), will take place Thursday, February 25 to Saturday, February 27 at the Collège Montmorency Gymnasium in Laval (475, boulevard de l’Avenir). It is located across the street from the Montmorency Metro Station. There is no admission charge. More than 500 eager and ambitious high school and CEGEP students will take part and call on their imagination and ingenuity to have the best robot and the best team in this year’s game called Pythagorium 2016. The organizers emphasize: “If you get to this competition with a working robot, you’re already a winner.” For the game schedule and live score updates during the competition visit: www.pythagorium.ca. For details and videos go to www.robo-crc.ca. Schools participating this year include the EMSB's Marymount Academy International in NDG. NUTRITION MONTH: To highlight the EMSB 2016 Nutrition Month 2016 Campaign, high school students are invited to take the 10 Plate Challenge: Small Changes, One Plate at a Time! The objective is to help high school students identify areas of their eating habits that require change and develop strategies to improve food choices, improve lifestyle habits and increase their nutritional knowledge! What to students have to do? Submit a one minute video describing which Plate Challenge they have chosen and how they will meet their challenge. For more information ask the school’s Physical Education and Health Teacher or click here. VINCENT MASSEY GYM: The EMSB will celebrate the long-awaited opening of a new double gymnasium and four additional classes at Vincent Massey Collegiate in Rosemount on March 18. Hundreds of elementary school students will be there for a special soccer play day. In the spring of 2012 the Quebec Ministry of Education announced funding in the amount of $4.3 million for Vincent Massey. EMSB Chairman Angela Mancini and Vice-Chairman Sylvia Lo Bianco worked diligently on this dossier for well over a year. Vincent Massey is an Article 240 special status school, with an enriched and structured CEGEP preparatory program. It has a student population of 814 in a building which was designed to accommodate 725 when it was constructed in 1959. The capacity is now 834. Caroline Derome accepts her award. ST. DOROTHY TEACHER WINS: The Delta Kappa Gamma (DKG) Society International promotes professional and personal growth of women educators and excellence in education. Retired EMSB principal Bev Townsend is the president of Gamma Quebec of DKG. “Gamma Quebec members energize me with their efforts and belief in each other that, together, we can continue to move forward,” she says. DKG Quebec members Val Delacretaz and Barb Angus recently presented an Early Educator Grant Award to St. Dorothy Elementary teacher Caroline Derome, in the presence of her principal Sandra Leveille. The Early Educator Grant of $300 is awarded annually by Gamma Quebec of DKG International to an EMSB teacher. QUITE A MONTH FOR MS. PERRON: Marylene Perron, the principal of the EMSB's Parkdale Elementary School in St. Laurent, was the only Quebecer to have been selected as one of The Learning Partnership’s Canada’s Outstanding Principals™ The program recognizes the unique and vital contributions of principals in publicly funded schools. This year, 40 principals representing every province and territory were chosen by a national selection committee on the basis of their exceptional contributions to their respective schools and communities. Ms. Perron received her award at the annual Outstanding Principals Gala on February 23 at the Westin Harbour Castle Hotel in Toronto. The winners also benefit from an exclusive five-day executive leadership training program at one of Canada’s top business schools, the University of Toronto’s Rotman School of Management. The program will introduce them to leadership and management practices presented by business, government and education leaders as well as Rotman instructors. They also benefit from a “Changing World of Work” day where they learn about today’s workforce from business leaders. Holly, Stedman Graham and Marylene. A few weeks earlier, Ms. Perron met Stedman Graham, an American educator, author, businessman and speaker, best known as the partner of media mogul Oprah Winfrey. 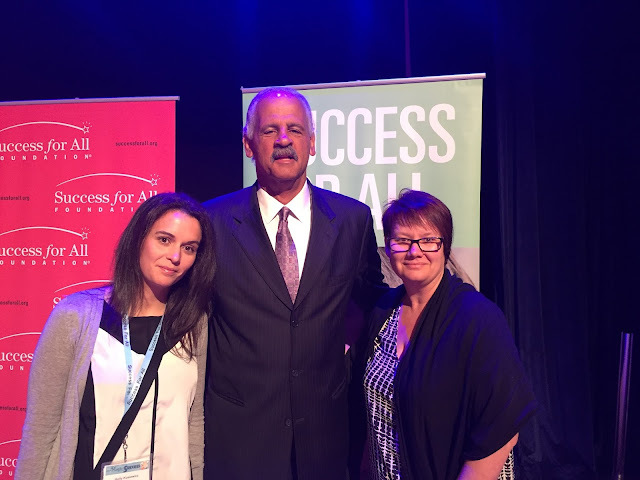 Ms. Perron was in California to attend the Success For All Foundation annual conference. She was joined by Holly Kusiewicz, a Grade 6 teacher and literacy facilitator. The Conference theme was the “Magic of Success.” The conference provided the opportunities for all SFAF schools to meet, connect and increase their knowledge in various interventions geared at literacy instruction, bullying prevention, and leadership and coaching. This year, the team from Parkdale had the opportunity to meet with Mr. Graham and Robert Slavin from the Foundation and John Hopkins University. 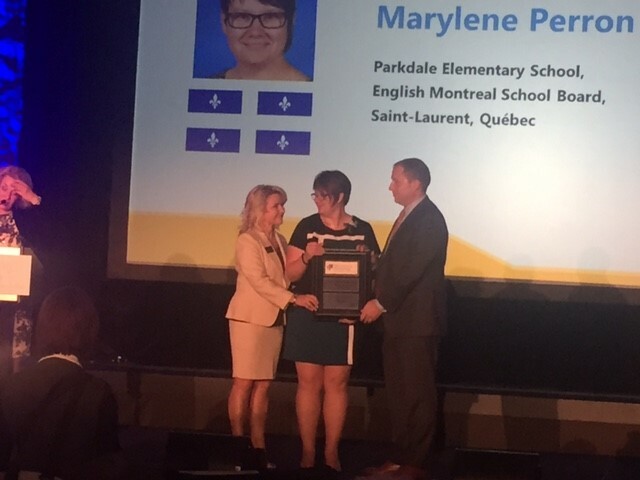 AWARD FOR PARKDALE: The Community Learning Centre at Parkdale was one of 186 schools or youth programs in Canada to earn the support of National Bank’s One for Youth program. The programs selected will share $1 million in funding. Parkdale submitted their Qu'est-ce qu'on mange? initiative which focuses on health and well-being through social entrepreneurship and community engagement. Through this project, Parkdale will give children the tools to access and create nutritious meals and provide a service in their community by donating meals to families in need. In doing so, the project will be providing the opportunity to learn French language skills and gain entrepreneurial skills. The One for Youth program, which is in its third year, aims to provide tangible support for youth, from birth to university, to build a better world. Across Canada, more than 30,000 young people will benefit. A TEACHER'S GREAT CYCLING ADVENTURE: In what is the most unique March Break activity to date, Gonzague La Roux de Bretagne, a Grade 6 teacher at Royal Vale School in N.D.G. is set to air up his tires and ride his bicycle from Bogota, Columbia to northern Chile, a journey of more than 6,000 kilometers. The journey, which will take a total of four months and pass through Columbia, Peru, Bolivia and Chile, was one that Gonzague has thought about for some time. An avid bicycler and traveler, the journey has long been a personal goal of his, one that he believes will put him to the ultimate physical and mental test. Throughout the trek, Gonzague will be communicating with his students through social media. His students will be able to follow his progress real-time via GPS. Through his blog, Facebook page and Twitter account, they will be able to correspond with him as well as learn about local culture and history. Gonzague and his adoring students. See the video : https://www.youtube.com/watch?v=4EPApw6Fdi0. STUDENT AT CARNEGIE HALL: Devon Packer, a Grade 5 student at Royal Vale School in NDG, won first prize at the Winner’s Recital of the International Crescendo Competition at New York City’s Carnegie Hall recently. Devon's mother, Paulana Layman, said her son started to play the piano at the age of four. He studies piano and composition at the McGill Conservatory of Music. 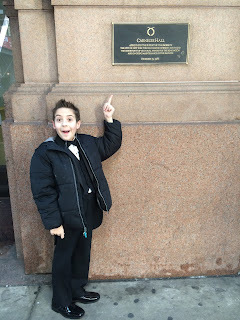 His goal is to become a composer/conductor/pianist. Devon has been winning music competitions since the age of six, and has performed both solo and with orchestra, at Oscar Peterson Hall and the Place des Arts. He had his first composition published last year at the Canadian Music Centre called "The Fantastical World of Camelot." Devon Packer at Carnegie Hall. Says Devon: “I feel classical music has more emotion than the music of today. My biggest musical inspiration is Leonard Bernstein because I want to be just like him when I grow up. “Devon’s father David has a degree in music and his maternal grandmother was a concert pianist. “He has more musical ability in his 10 year old body than most musicians I have seen or worked with,” says his dad. Over the last several weeks, Devon’s adventure has been covered by CTV Montreal, Canada AM, Global News, Breakfast Television, Rendezvous Magazine and CBC Daybreak. Here is the Breakfast Television clip. PINK SHIRT DAY: Rosemount High School participated in Pink Shirt Day this year as part of an orientation which has seen students promote awareness against bullying by creating their own Pink T-Shirt. The art students in Sabrina Bejba's art classes entered the RHS Pink T-Shirt contest and created their own logos and pictures depicting what they thought the anti-bullying campaign should look like. Breakfast TV`s Derek Fage, Carlie Sznerch, Paul Karpontinis and LBPHS Principal Carmen Nicolas. The winning image was awarded to Secondary IV student Julianne Nadeau. With the help of spiritual animator, Vince Lacroce, and Rosemount Technology Centre teacher, Antonio Leone, Julianne's logo was developed into this year's RHS Pink T-Shirt. Students got the opportunity to buy the shirt and part of the proceeds went to building a home in Kenya. Students wore their pink shirts on February 24 to support the anti-bullying initiative. On Breakfast Television, host Derek Fage welcomed teacher Paul Karpontinis and student Carlie Sznerch from Lester B, Pearson High School to talk about their participation.. Here is the segment. KINDNESS: Students at three EMSB elementary schools: Edward Murphy in Hochelaga-Maisonneuve, East Hill in RDP and Gerald McShane in Montreal North, spent the past several months of the year immersed in kindness projects. 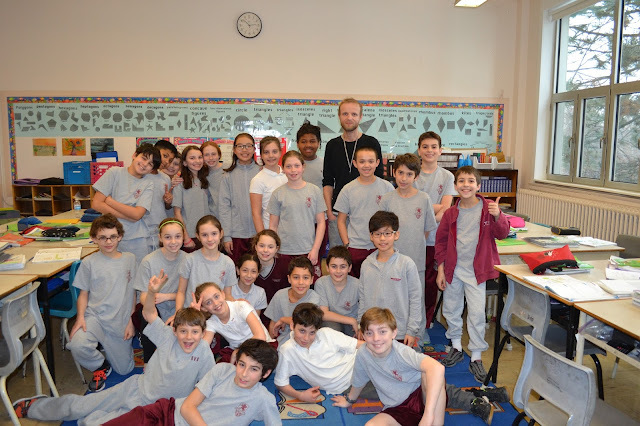 With the projects varying per grade, Spiritual and Community Animator Rocco Speranza has been working with students in order to further their understanding of others in a compassionate, respectful manner while encouraging them to give back to their community via being the positive change. Students are exploring the themes of Keep Kind in Mind, Stand Up and Be Kind, Stand Up - Be Yourself and Think Pink. Under the leadership of Mr. Speranza, teachers, administration and daycare staff will build upon these lessons to ensure that students are aware that even the simplest act of kindness, such as a hello or a smile can make a positive long term difference in someone's life. These lessons will culminate in a larger project that will spread kindness and messages of hope and love to patients at the Montreal Children's Hospital in late February. 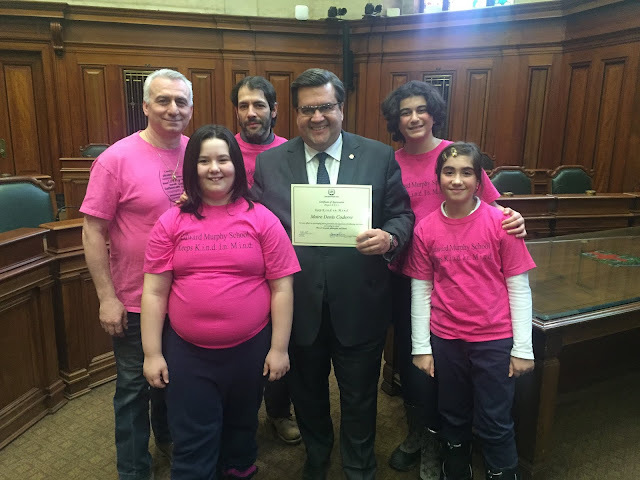 Denis Coderre, Mayor of Montreal, recently took the time to meet with Cycle 3 students as well as Mr. Speranza as he lent his support to their Pink Shirt/Kindness Campaign. Annually, the school, along with Vincent Massey Collegiate in Rosemount, seeks out celebrities to film positive messages for the campaign. In the past, students have received messages of support from the Right Honourable Justin Trudeau; CBC’s Rick Mercer; Singers Shawn Desmond and Pierre Bouvier (Simple Plan); Olympians Rhian Wilkinson; Richard Pound, former Vice-President of the International Olympic Committee as well as a number of local media personalities such as Paul Karwatsky (CTV News), Frank Cavallaro (CBC Montreal), Shaun McMahon (92.5 The Beat) and Andrew Carter (CJAD 800), In addition to filming Mayor Coderre for the school's public service announcement, students also received a tour of City Hall. See this fabulous video, with many notable personalities promoting kindness. Pascal Fleury stands tall with students, staff and law enforcement officers. BASKETBALL WITH POLICE: As students and staff at Edward Murphy School in Hochelaga-Maisonneuve are Keeping K.i.n.d I.n. M.i.n.d. throughout February, the staff squared off against SPVM Station 48 in the first annual friendly EMS/SPVM community basketball game. Led by former Harlem Globetrotter Pascal Fleury, the officers spent time with the students prior to the game, conveying the message about the importance of following one’s dreams and persevering through any and all difficultie. For the special guests, they ran into a different kind of adversity come tip-off as they were pitted against a staff that came ready to play. Supported by the entire student body, Edward Murphy School narrowly edged out Fleury and Station 48 by a score of 18-16, with Fleury accounting for all 16 SPVM points. Lina Di Giovanni, Peter Iannitelli, Joe Schembri, Matthew Valente and Enza De Marco with students. ARCTIC SCHOOL TOUR: Two members of the Quebec Junior AAA League St. Léonard/Montreal North Arctic, Peter Iannitelli and Matthew Valente, visited General Vanier Elementary School recently. As is customary for these successful school events, which have been taking place at East End schools since the fall, the players spoke about the importance of staying in school, answered questions and took part in a friendly floor hockey scrimmage. Valente was a student at General Vanier. He was reunited with his former physical education teacher Enza De Marco who, like Principal Giuseppe Schembri, took part in a tie-breaking shootout. 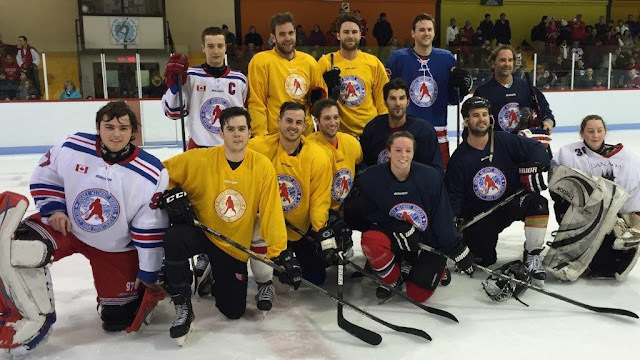 The Arctic, owned by former EMSB parents Joe Perretta and Lina Di Giovanni, have had a successful season and they are headed for the playoffs. Throughout the season they have given away blocks of tickets to EMSB schools and the response has been very positive. Here is their website. ON HOLD MESSAGE: The adorable voices of Benjamin Merhi and Ella Derlachter, Grade 5 students from Edinburgh Elementary School in Montreal West, are the ones keeping you company when you’re placed on hold when calling the EMSB. Both Benjamin and Ella were excited to participate in the recordings and teachers Helen Botsas and Geneviève Hébert were thrilled to help them prepare! Students, family members from China and staff. CHINESE NEW YEAR WESTMOUNT PARK: The atmosphere was filled with Chinese music recently at Westmount Park Elementary School as Grade 1 students and teacher Martyniak anticipated the arrival of family members of students from China to celebrate the first day of the Chinese New Year (Year of the Monkey). The families gifted the students with handmade bookmarks, calendars and red envelopes which contained sweets. One mom assembled homemade calendars and everyone feasted on homemade dumplings made by another mom. BOXING CHAMP: With Manny Pacquiao set to retire in April, Christopher Guerrero from Lester B. Pearson High School is already being groomed to fill the void! Congratulations to the Secondary III student who captured gold in the Juvenile 66 kg division at the 2016 International Brampton Cup of boxing this past weekend. WEB SUPPORT FOR SCHOOLS: Andrea Di Tomaso, the EMSB webmaster for schools, provides this update. Designs for Honoré Mercier, Edinburgh and Bancroft have been completed. Websites coming soon will be Sinclair Laird and Rosemount High. Schools are urged to update their websites regularly with pertinent information. The webmaster for schools is available to help with updates and to answer questions. New and exciting improvements are coming to school websites across the EMSB. Stay tuned for more information. 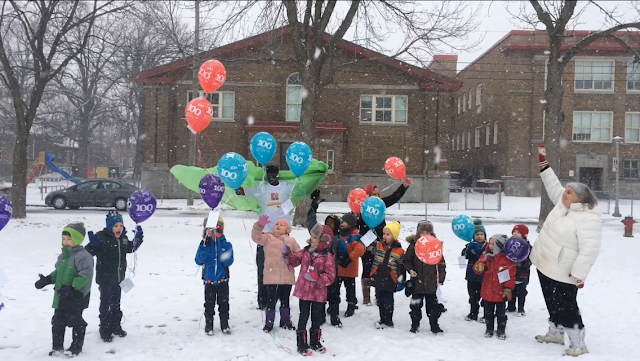 100TH DAY OF LEARNING: With Wednesday, February 24 marking the 100th day of classes, students at Elizabeth Ballantyne Elementary School in Montreal West celebrated the milestone with a day of exciting activities which began in the schoolyard when the bell rang. Together, 100 students lined up and entered the school as one. Once in class, teachers in Kindergarten and Cycle I had a number of exciting activities planned, as annually, teachers use this milestone as a huge learning experience for the children. Meanwhile, Hampstead School marked the 100th day of school on February 19. That means 100 days of learning since the first day of school, and 100 days smarter! Several classes celebrated in their own ways through fun activities and projects, including 100th-day-of-school hats. All students and staff were also treated to a 100th-day cupcake to top off this special day. MEET THE NEIGHBOURHOOD: In a project that would make Mister Rogers proud, Grade 11 students at Laurier Macdonald High School in St. Léonard spent time in their neighbourhood recently, visiting local businesses and getting to know their owners and the staff. The initiative was spearheaded by the school’s Community Learning Centre (CLC) along with George Kalliabetsos’ Creative Writing class, with the goal of making connections with the individuals and businesses that the students and their families frequent on a daily basis. Groups of students visited St-Hubert Express, Boucherie Mimmo, Dépanneur 7 Jours, Thai Express, IGA, Tim Horton’s and Pizzeria Orsini. Along with getting to know their neighbours, they also received some insight into what it takes to run a successful business. The students were repeatedly told that often one does not end up doing what he or she thought they would be doing. Students were told that jobs change as well as career paths and opportunities often take them away from where they started, but with perseverance and the enthusiasm to do their best every step of the way; they will build experience and knowledge. A one-time bus boy now manages the St-Hubert Express with a plan to own his own franchise in five years. They also learned that time management is critical and sometimes they will have to juggle several obligations to climb to the top, like what Connie Long is presently doing. Long co-manages a Thai Express with her husband, works as a night nurse part-time, goes to school full-time and is also raising her two young children. Through these opportunities to meet, connections were made and relationships initiated. Students can now further appreciate that everybody, even that person serving them behind the cash during lunchtime, has an interesting story to tell. JFK staff, students and Regional Director Anna Villalta accept the cheque from Best Buy. 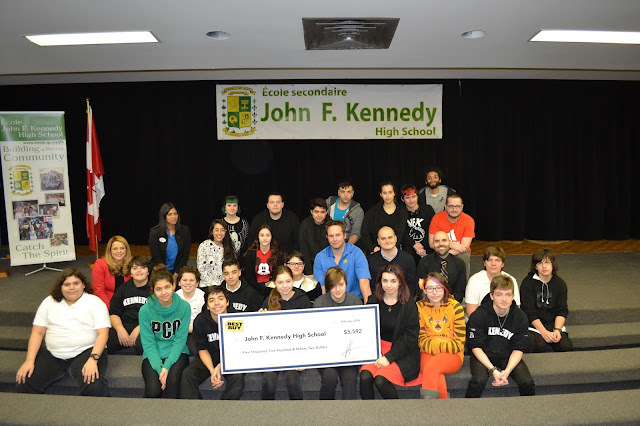 JFK’S BEST BUY: Hollywood North might soon have to include Montreal’s East End as the John F. Kennedy High School Film Cub has received a $5,592 school technology grant from Best Buy Canada. An official cheque presentation took place on February 24 at the St. Michel school. JFK’s blossoming film club has quickly become one of the most popular extra-curricular activities at the school. More than just a place for students to develop skills in film writing, producing, and editing, for many of the students who it is a sanctuary and a way for them to connect with their school. With their Best Buy Canada School Tech Grant, the film club will purchase new cameras, lighting equipment, tripod kits and editing software that will allow more students to get involved in the program and keep students inspired and motivated to continue finding their hidden talents and their place in the school community. DANCING WITH THE STARS: NDG’s Christine Griffin is the mother of eight children. Her youngest, Apollonia, 12, a student at Westmount High School was born with a cleft palate. “The doctors kept her in the ICU for two weeks and she had to be fed through a tube, it hurt me not to be able to nurse her as I had my other children,” said Griffin. “Finally, I was able to take her home after the nurses taught me how to feed her on my own. At 11 months, she underwent her first surgery to fix her palate, but it didn’t fully close. After years of regular check-ups and speech therapy, she had her final surgery at the age of seven, which was a huge success thanks to Dr. Mirko Gilardino. Christine Griffin at far right in the Rocky Horror number. Griffin was among the participants in the recent 10th annual Just for Kids Foundation Dancing with the Stars event, which raised $310,000 as part of A Vision for The Future campaign to purchase high priority medical equipment for departments at the Montreal Children’s Hospital. This includes Ophthalmology, Cardiology, Cranio-Facial Surgery and the NICU. See the full story. Teacher Peter Tsatoumas at Dancing With The Stars. EMSB AT THE CHILDREN'S: When a child is admitted to the Montreal Children's Hospital (MCH) of the McGill University Health Centre (MUHC), be it for a short or long term stay, they can count on their educational needs being taken care of thanks to the EMSB which as a team of two teachers assigned full-time there- David Weiss and Peter Tsatoumas. Dr. Harvey Guyda, associate executive director of the hospital. “They bring in the normal part of life in a world filled with challenging medical issues. They provide academic support to our patients to insure that their school year is not compromised and that they will be ready to go back in their own school when being discharged from the hospital. The teachers often go beyond their role by providing emotional support as they become supportive adults who are able to show compassion to the patients.” Here is a complete backgrounder. Mr. Tsatoumas was recently a guest of JFK at the Dancing with the Stars event. SHAKE IT OFF: A number of East End schools continue to incorporate innovative programs intended to promote healthy eating habits and lifestyles. At Perspectives I Alternative High School in St. Michel, students began the New Year by learning how to make healthy fruit and vegetable shakes, ensuring it becomes a part of their regular diet. As students experiment and create recipes, their ideas will be catalogued and fill the contents of a cookbook entitled “U Hungry?” The book will be tailored to students interested in simple, tasty and healthy food, as well as to inspire them to continue this lifestyle at home. At school, the shakes will be complemented with healthy snacks. For the athletes at Rosemount High School, their performance is squarely dependent on their energy levels, and for that reason the school is testing out the Awake with a Shake program. Staff members will be creating healthy shakes for their athletes consisting of ingredients such as spinach, kale, flaxseed and fruit in order to provide the much needed energy boost before or after competition. In concert with the new diet, the Physical Education department will be monitoring the energy levels of preselected athletes and will continue to promote the importance of healthy eating. At the culmination of the program, a certified yoga instructor will host a class for students and reinforce the ideas of reflection, proper diet, and exercise. At the elementary level, students at Dalkeith in Anjou and Nesbitt in Rosemount will also participate in a similar program to the athletes at Rosemount High School. Cycle 2 and 3 classes will start their days with healthy fruit and vegetable shakes. Their program will also wrap up with a class from a certified yoga instructor. A number of individuals are working together to ensure the success of these programs. Spiritual Community Animator Vince Lacroce is overseeing the initiatives along with: Barbara White, Frank Caracciolo and Elisa Ruffini (Perspectives I); the administration and Physical Education department of Rosemount High School); John Wright and Patty Smyth (Dalkeith); and Antoniette Scrocca (Nesbitt). The Lester B. Pearson High School We Day delegation. WE DAY: A number of EMSB schools once again participated in We Day, an inspirational event fuelled by an educational initiative. Together, "We Schools" connect and empower a new generation to shift the world from me to we—from a focus on the individual to the power of community. An unparalleled stadium-sized experience, held at Theatre St. Denis, We Day brings together world-renowned speakers and performers with stands packed with young social innovators to honour their contributions and kick-start another year of change. More than a one-day event, We Day is connected to the yearlong We Schools program, which offers educational resources and campaigns to help young people turn the day’s inspiration into sustained action. The event itself serves as a springboard nurturing a sense of youth-empowerment and social activism. Students were treated to motivational speakers as well as energizing musical performances. The Free the Children organization supports sustainable development in emergent countries though education, fundraising and hands on volunteerism. What made this year’s We Day even more special for students of Lester B, Pearson High School was that their own Student Council Co-President Cristina Mignacca addressed the theatre of 2,000 students and educators. Her message about her passion for the environment, challenged the audience to work together to build a cleaner, greener and brighter future together. Here is Lester B. Pearson High School Student Council Co-President Cristina Mignacca's opening remarks. FREE THE CHILDREN: The eyes of students at Dalkeith Elementary School in Anjou and Rosemount High School have been squarely on Kenya as both schools launched initiatives through the Free the Children organization to benefit children and families. Rosemount students began a three-year Adopt a Village program, where proceeds from various fundraising efforts will be directed to developing communities in Kenya. These communities are notorious for high levels of child labour, exploitation and minimal opportunities for advancement. Ultimately, the efforts will lead to the construction of a school. The first fundraising activity at Rosemount was the Comedy for a Cause fundraiser, which was held in October. Students at Dalkeith will build on momentum from We Day on February 22 to begin the Farm Animal Bundle project. Proceeds from their fundraising initiative will sponsor families in developing communities through the purchase of three goats and 15 chicks. The ultimate goal of the project is to teach families the skills to run a sustainable business and lead to self-sufficiency. Spiritual and Community Animator Vince Lacroce and Sandra Trevisonno, Cycle 3 teacher at Dalkeith, are overseeing the respective projects. EAST HILL CARES: February is a wonderful reminder to be kind, considerate, and giving. Using this season’s theme as a guide East Hill Elementary School B.A.S.E. daycare students took the initiative to give back. What started off as an after school art project, turned into a very successful collaboration of students from kindergarten to Grade 6 working together to make the keychain tuques. Students used their marketing and business skills to create a likeable design and put in their own time to sell it. They created key chain “tuques” using yarn and recyclable materials. Before they knew it, children from every grade in the school were lining up at lunch to purchase this unique creation. The daycare students had to work very hard to make sure their supply met a very high demand. All their hard effort and dedication paid off, they sold 1, 154 key chains and ultimately raised $2,300! The students are generously donating all profits to the Montreal Children’s Hospital with great joy and excitement! Along with their donation, they have set a delightful tone in the school reminding one another how good it feels to give back and spread the love. Left to right : Alex Kuczyk, Anne Marie De Silva, Tya Collins, and Colleen Ovenden. NULMAN A WINNER: Stuart Nulman, who works on special projects for the EMSB Communications & Marketing Division and coordinates the Exam Room, was one of three adult volunteer advisors from BBYO (B’nai Brith Youth Organization) to be chosen as Advisor of the Year, and was awarded with the prestigious David Bittker Unsung Hero Award at BBYO’s annual International Convention, which was held in Baltimore, Maryland from February 11 to 15, and attracted a record crowd of over 4,000 people, including 2,400 Jewish teens from around the world from countries such as Canada, the United States, Israel, Ireland and the UK, Bulgaria, Denmark, France, Turkey, Argentina, Uruguay and even Cuba. 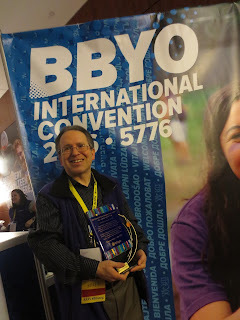 Stuart joined BBYO as a member in Montreal back in 1976 and six years later, became an advisor, which is an adult volunteer, usually a former BBYO member, who works with a chapter of Jewish teens between the ages of 13 and 18 in an advisory and mentoring capacity. Stuart still serves as an advisor for BBYO in Eastern Canada Region – which comprises of Montreal and Ottawa – and on an international level, staffs International Convention and the popular Chapter Leadership Training Conference (CLTC) on a yearly basis. Anne-Marie De Silva leads the discussion. KINDERgartenTHRIVING: The very successful KINDERgarten program, introduced last year to combat bullying and acts of aggression while fostering compassion and acts of kindness at the kindergarten level, is moving along nicely. The first of four KINDERgarten professional development sessions planned for 2016 was held on February 17. Guest speaker Dr. Tara Wilkie kick-started the day with a presentation on the concept of social emotional learning and its application in the classroom. The team consisted of seven kindergarten teachers representing six EMSB schools. Kindergarten Consultant Tracy Mangal, ERC Consultant Anne-Marie De Silva andViolence Prevention Consultant Daphna Leibovici are facilitating the program. HUGGIES VALENTINE’S DAY: For the 14th consecutive year, students from nine schools across the EMSB participated in the Huggies Valentine’s Day Toy Basket and Card Drive. Since 2003, the schools and the students have collected over 8,000 gifts and created over 1,500 gift baskets for the patients at the Montreal Children’s Hospital. The project originated at Michelangelo International Academy in R.D.P. where Spiritual and Community Animator Vince Lacroce and Cycle I teacher Sonia Arnoldo worked together to bring some cheer to Sabrina Di Giandomenico. Sadly, Sabrina passed away from a brain tumour later that year, but the project continued in her memory. Each basket contains new non-violent toys, games, books, and personalized Valentine's Day cards made by the students. Lacroce notes that students spend the morning at the Montreal Children’s Hospital and connect with the patients by distributing toys, books, handmade cards and, of course, lots of smiles. Rocco Speranza, another animator says that the goal of the project is to spread the messages of joy, love, and hope and community spirit to children who are ill in our community. Students from Rosemount High School, Vincent Massey Collegiate and Nesbitt Elementary School in Rosemount; Perspectives I & II High Schools in St. Michel; Dalkeith Elementary School in Anjou; Edward Murphy Elementary School in Hochelaga-Maisonneuve; Gerald McShane Elementary School in Montreal North and East Hill Elementary School in R.D.P participated in this year’s drive. See photo album. INTERNET SAFETY: Two Secondary V students from Lester B. Pearson High School were guests on CBC Radio Noon with host Shawn Appel recently to talk about internet safety. They did a great job. You can listen here. CORRIDOR VERT: A new video has been posted, promoting the Corridor Vert project involving Gerald McShane Elementary School, Lester B. Pearson High School and the borough of Montreal North. Here it is. ANNUAL REPORT: The 2014-2015 EMSB Annual Report is available for viewing online. The English version is here. The French version is here. 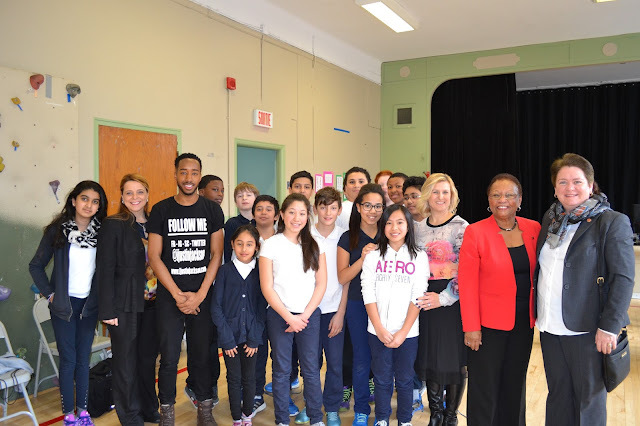 Justin Jackson, Veronica Mae Johnson joins students, staff and EMSB officials at Nesbitt. BLACK HISTORY MONTH: EMSB schools marked Black History Month in a number of ways. Nesbitt Elementary School in Rosemount and Rosemount High School had special events on February 11 and 17 respectively. These programs were geared towards moving students to a new level of self-awareness by making positive changes in the community and highlighting the beautiful traditions and role models of the Black Community. Nesbitt invited Citizenship Judge Veronica Mae Johnson (the mom of CTV’s Maya Johnson), who spoke about the importance of having a dream and uniting people. She was joined by dancer Justin Jackson, the Coronation Elementary School Steel Pan Band and members from L’Académie De Danse de Montréal. Rosemount High invited Global TV`s Elysia Bryan-Baynes, Justin Jackson, the Coronation Elementary School Steel Pan Band and L’Académie de Danse de Montréal. See this Global TV report. Principal Claude Dansereau and some of his students at LaurenHill mark Black History Month. 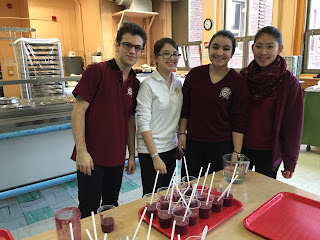 LAURENHILL TUQUES: During the month of February, students were engaged in a number of activities to celebrate Black History Month at LaurenHill Academy in St. Laurent. The introduction included a competition among homerooms, where the winning entry got to taste an authentic Caribbean breakfast prepared by a parent. The students taught others a dance routine during lunch, while other where involved in different workshops, like cornrow lessons. During one week, the students expressed a daily quote that marked the event, through the intercom. Artists such as Just Aissi and Johnny-Walker Bien Aimé were invited into the dance classes, where the students performed routines using gumboots and breakdancing. ELA classes invited artists Dan Parker and Chris Masson for Spoken Word and Slam Poetry. The students were able to broadcast some of their work on LHA The Voice, the in-school live radio program. The month ended with students displaying many of their talents in the auditorium during the lunch period. Finally, the celebrations were even more successful through our partnership with the young students from Coronation who were invited to play steelpans during the Taste of the Islands celebration. Principal Claude Dansereau showed his appreciation to our special guests by thanking them with LaurenHill tuques. BINTI’S JOURNEY: In recognition of Black History Month, three Alternative schools: Options, Elizabeth and Venture welcomed the Black Theatre Workshop’s presentation of Binti’s Journey. The one-hour play follows Binti, an AIDS orphan, on a life changing journey to discover what is precious about life, and what is special about herself. Students ran the gamut of emotions, laughing and reflecting during the inspiring performance. For over 20 years, the Black Theatre Workshop has celebrated Black History Month by touring its plays in schools, libraries and community centers in and around Montreal. Their goal is to create a greater cross-cultural understanding and to bring far-reaching and powerful theatre experiences to young audiences. The activity was organized by the English Montreal School Board’s newest Spiritual and Community Animator, Pierre-Luc Lajoie. from James Lyng High School have organized and curated a multi-media art exhibit that celebrates the lives of African-Americans who have contributed to the fight for racial equality. The art show, entitled “The Struggle for Black Equality,” showcases visual art and music created by students from James Lyng, Westmount High School, La Maison de Jeunes de la Côte-des-Neiges and Dawson College, alongside contributions from professional street artists such as Turtle Caps, Jimmie Baptiste and Miss Me. The exhibit will open on Thursday, February 25 with a vernissage from 2:30 to 3:30 p.m., as well as from 6 to 8 p.m., at the Up Next Gallery, a student-run art gallery located in the school, and will continue until March 24. “Our show is about people who have overcome racial discrimination and have done great things,” says student organizer Chad Deer. “We have received submissions from artists and musicians all over Montreal.” The event is open to the public. Info: www.upnextgallery.weebly.com. See the press release. CHESS MATCH: Lester B Pearson High School in Montreal North hosted the first of six chess meets on February 16 with L.I.N.K.S High School in Ahuntsic. The event was held in the school’s Plaza area as club organizers aim to channel their efforts into increasing student participation in the game of chess. Students from both clubs are very much looking forward to this meeting, eager to learn new things from one another. L.I.N.K.S is one of EMSB’s alternative schools that offer quality education to a wide range of students with various special needs. The chess club allows them to join together with a common interest and goal. Math Technology teacher Rosaliza L. Pe says the school is excited to host this event. She notes that most of her chess players and organizers are resource students who are training for their final game on June 1 against Royal West Academy in Montreal West (Battle of Thrones ll) and possibly John F. Kennedy High School in St. Michel and Vincent Massey Collegiate in Rosemount. MUSICAL SHOW OFF: The producers of Musical Show Off have announced plans for their sixth season, showcasing Montreal’s best young triple threat talent, with the 2016 grand finale set for June 26 at the beautiful Rialto Theatre. Many EMSB students take part in this program. Musical Show Off is a marketing partner of the EMSB. DAVID MARINO PERFORMS: Vincent Massey Collegiate graduate David Marino will be holding a concert in collaboration with the Jewish General Hospital on April 7 at the Leonardo Da Vinci Centre in St. Léonard. 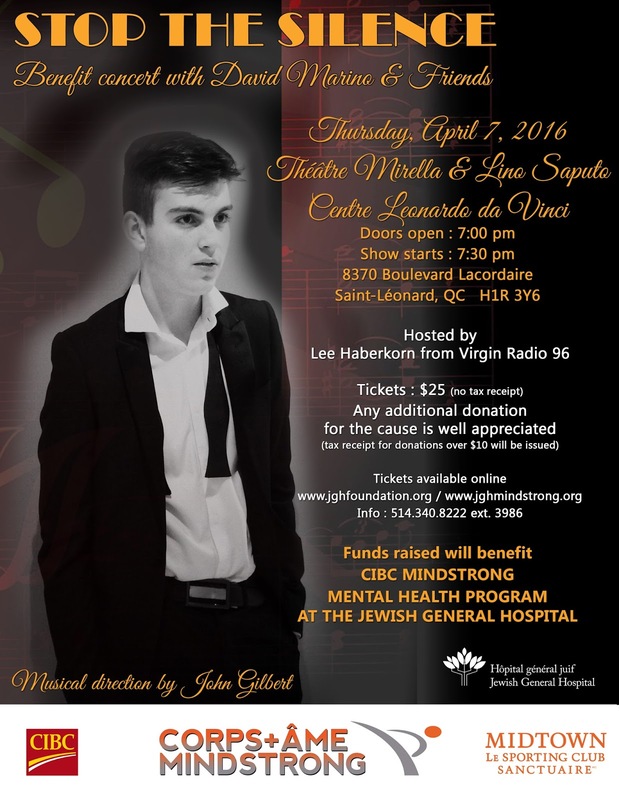 This concert will raise funds for the mental health program Mindstrong at the hospital. “Mental health is an extremely important cause, and it is important that we raise funds and spread awareness about it,” says David. “We need to stop the silence amongst those struggling with their mental health. I am hoping for a sold out show to maximize the profits going to the hospital. Tickets can be purchased on line on the sites on the flyer and here: https://jghfoundation.akaraisin.com/stopthesilence. See the flyer. PHOTOS: New photos of the EMSB Board and School Administrators are now on the ePortal. The photos are filed by alphabetical order as well as by school for ease of use. Please click here for a direct link to the Communications ePortal site. If you are an administrator (Principal, Vice-Principal, Manager, Director, Assistant-Director, Officer) and do not have your photo on the portal, please attach a recent photo of you to an e-mail with your full name, title and place of work and I will add you to the directory. ENCOUNTERS WITH CANADA: Every year, Encounters with Canada - the country’s leading youth forum - welcomes students aged 14 to 17 from across the EMSB. The students join teens from across the country at the Terry Fox Canadian Youth Centre in Ottawa, for an unforgettable week of bilingual workshops, outings and cultural events. They learn about Canadian institutions, meet accomplished Canadians, explore exciting career options and develop their civic leadership skills. They experience Canada’s diverse culture and heritage, learn about contemporary issues, and explore their own potential. More than 100,000 students have already lived the experience! Encounters with Canada offers a choice of 13 different themes, each one week long: Arts & Culture; Canada Remembers; Democracy & Youth; Experience Canada; First Responders; International Relations; Journalism & Communications; Law & Our Justice System; Medicine & Health; Science & Ecology; Science & Technology; Sports & Fitness; and Vimy: Canada’s Coming of Age. Encounters with Canada is open to all students aged 14 to 17, and approximately 130 teens from across the country take part each week. The EMSB offers 20 subsidies each year, with a maximum of two per school. For more information about this year’s program, subsidies and registration, contact your school’s guidance counsellor or Travis Hall, Pedagogical Consultant, Career Development at thall@emsb.qc.ca or (514) 483-7200, ext. 7818. For additional information about Encounters with Canada, go to www.ewc-rdc.ca. CENTAUR THEATRE OF TOMORROW PROGRAM: Centaur Theatre Company announces its Luminous Theatre of Tomorrow (TOT) Program for the 2015-2016 Season. The TOT program makes live English theatre accessible to High School students at a discounted price. Tickets remain at $16 for another year thanks to our sponsors. Program benefits include a teacher’s guide providing background information, discussion topics and improvisation activities; and talkback sessions following the performances where students meet the cast, voice their comments and ask questions. For schedule and teacher’s guide, go to http://www.centaurtheatre.com/schools.html. For Bookings and inquiries email groups@centaurtheatre.com or call 514-288-1229 ext. 245. The road to happiness is paved with potholes, detours and toll booths. In this disarming comedy-drama, a bickering couple driving to a friend's birthday party may or may not have hit a young woman who came out of nowhere... they can't agree. To keep an eye on her, they insist she join them at the celebration. As the day unfolds and the wine flows, the meaning of happiness becomes the focus of discussion and the mysterious stranger’s curiosity and unflinching honesty provide new fodder for the couples to re-examine their lives and key relationships. Is the pursuit of happiness still at the root of every life choice or has it become a forgotten dream? PROMOTIONAL ITEMS: Funkins (www.funkins.ca) was a sponsor of the EMSB’s 2015t Volunteer Appreciation Evening. They are a leading supplier of customized promotional products. Call or email Steven Mitchell at 514-333-9552 or steven@funkins.ca. SUPPORTING THE HABS: Galileo Adult Education Centre in Montreal North teacher Ana Persichilli, along with her colleagues and their students living with special needs, are the biggest fans of the Montreal Canadiens. In response to the negative media coverage they received due to a losing streak, the Galileo team felt the Habs needed to feel the love from their most loyal fans. Thus, Miss Ana had the idea to start the biggest “wave of love” at Galileo and inspire other EMSB schools to follow and create the biggest wave in Montreal! See the video. Here is a Global TV report. LIBRARY VISIT: When was the last time you visited a library? Galileo Adult Centre CCBE students in Micheline Papazian’s class visited their local library for an opportunity to learn about its services. The most interesting new service being offered is the loaning of tablets and online e-books. Gone are the days where a library was only a designated quiet place of study. Learning a language effectively requires the sharing of stories and visiting the library assists in research skills necessary in finding stories that resonate with international students. 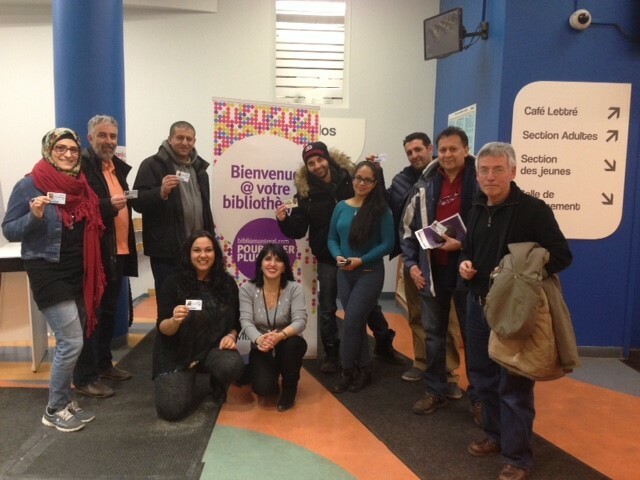 At the end of their tour the students had the opportunity to obtain a Montreal Library card. The hockey players take a break. HOCKEY WITHOUT BORDERS: Samuel Moskovitch Arena in Côte Saint-Luc was the venue and hockey was on the agenda, but what transpired on the ice was an afterthought to the whole spectacle. A few hundred special needs students from Marymount Adult Education Centre and John Grant High School made their way to the arena to take in their first ever hockey game. “We also have students from over 75 countries learning French or English who have never seen a game. It’s part of our job to have them share the culture,” said Jacques Monfette, the principal of Marymount Adult Education Centre. See this blog written by communications intern Gregory Caltabanis. Displaying one of the shirts. LYNG ADULT CENTRE PARTNERSHIP: In 2012, the James Lyng Adult Centre developed a partnership with Studio Sans Limites, a program offered by Autisme Sans Limites. This mission of this program is to facilitate the social integration of autistic adults through continuing education, skill development and work training. James Lyng Adult Centre opened its doors to Studio Sans Limites by offering work space and a teacher to work with its students, better known as apprentices. The apprentices master work skills such as the printing press. The team has worked on printing logos on t-shirts for a number of companies, and produce excellent work! Paul Fernandes, an apprentice in the Studio Sans Limites program at James Lyng Adult Centre was selected to represent Canada, and compete in the 9th International Abilympics in Bordeaux, France on March 25 and 26. The Abilympics organization celebrates and enhances the employability skills of people with disabilities through inclusive skills competitions that foster independence, international exchange, friendship, and public awareness. Paul will be competing for Canada in the E-Sport category of the Abilympics, specifically a video game that must be successfully completed within a time limit. The first contestant to complete the game will win the Gold medal for the E-Sport category. Paul will be competing with contestants from around the world. Best of luck to Paul Fernandes! ST. PIUS X ON CTV: The CTV Montreal feature Sunday Bite featured an excellent profile on the EMSB's St. Pius X Culinary Institute. Here it is. PROJET DE LOI 86: La CSEM devait se présenter aux auditions parlementaires à Québec le 16 février sur le projet de loi 86 : Une Loi modifiant l’organisation et la gouvernance des commissions scolaires. Si le projet de loi est adopté, il restructura les commissions scolaires de la province en limitant le droit du public à élire des commissaires scolaires. Mais la date de la CSEM a été annule, La CSEM s’oppose vigoureusement à la proposition de loi. "Je voudrais souligner que notre Commission a le taux de réussite le plus élevé de la province à 88 pour cent et nous avons été en mesure d’adopter un budget équilibré malgré les défis fiscaux que nous devons affronter. Pourquoi vouloir réparer un système qui fonctionne? C’est la question que nous avons posé au ministre précédent et nous transmettrons le même message lors des audiences » a déclaré La présidente de la CSEM, Angela Mancini. PERSÉVÉRANCE SCOLAIRE: La sixième édition des Journées de la persévérance scolaire a eu lieu du 15 au 19 février. Martine Legault-Ciccia a été la représentante de la CSEM à ce programme qui est axé sur les activités de persévérance scolaire. La CSEM a le taux de réussite le plus élevé (87,9 pour cent) de la province, basé sur la progression d’élèves de 2007 à 2014. Ceci est d’autant plus impressionnant étant donné que le taux de réussite à travers la province est de 77,7 pour cent. Tout au long de l’année, l’organisation qui compte 33 partenaires représentant les secteurs de l’éducation, communautaires et du monde des affaires, a concentré son attention sur la persévérance scolaire et en a fait une priorité pour toutes les écoles de la province. Des campagnes de sensibilisation, telles que la Semaine de la persévérance scolaire, ont permis aux élèves, aux familles et aux communautés de comprendre la valeur de l’éducation. Le lancement régional des Journées de la persévérance scolaire a eu lieu à l’école secondaire James Lyng. L’école secondaire Lester B. Pearson de Montréal-Nord ainsi que d’autres écoles ont organisé plusieurs programmes. ENFANTS ENTRAIDE: Les regards des élèves de l’école primaire Dalkeith et de l’école secondaire Rosemont se sont posés sur le Kenya alors que les deux écoles ont lancé des initiatives par le biais de l’organisation Enfants Entraide au profit d’enfants et de familles. Les élèves de Rosemont ont lancé un programme de trois ans Adopter un Village dont les produits de diverses levées de fonds seront dirigés vers des communautés en voie de développement du Kenya. Ces communautés sont reconnues pour des niveaux élevés de travail des enfants, d’exploitation et de perspectives minimes d’avancement. Tous les efforts déployés aboutiront à la construction d’une école. La première activité de levée de fonds à Rosemont a été l’évènement Comédie pour une Cause qui a eu lieu en octobre. Les élèves de Dalkeith profiteront de l’élan de We Day le 22 février pour commencer le projet Farm Animal Bundle. Les produits de leur levée de fonds aideront des familles de communautés en développement par le biais d’achat de trois chèvres et de 15 poulets. Le but ultime du projet est d’enseigner aux familles comment diriger une entreprise durable et atteindre l’autosuffisance. L’animateur de vie spirituelle Vince Lacroce et Sandra Trevisonno, enseignante de Cycle 3 à l’école primaire Dalkeith supervisent les projets respectifs. PRÉSENCE DE LA CSEM: Lorsque des enfants sont admis à l’Hôpital de Montréal pour enfants du Centre universitaire de santé McGill , que ce soit pour un long ou court séjour, ils peuvent être assurés que leurs besoins éducatifs sont servis grâce à une équipe de deux enseignants de la CSEM- David Weiss et Peter Tsatoumas – affectés à temps plein à l’hôpital. Il y aussi trois autres enseignants de la Commission scolaire de Montréal (CSDM) qui s’occupent des élèves francophones. « Les enseignants à l’Hôpital de Montréal pour enfants font vraiment une différence pour nos patients qui doivent être hospitalisés pour une longue période de temps » déclare le Dr. Harvey Gouda, directeur exécutif associé de l’hôpital. « Ils offrent une partie normale de la vie dans un monde plein de problèmes médicaux difficiles. Ils offrent le soutien académique à nos patients afin d’assurer que leur année scolaire ne soit pas compromise et qu’ils soient prêts à retourner à leur école lorsqu’ils quitteront l’hôpital. Les enseignants vont souvent au-delà de leur rôle en offrant un soutien émotif et en étant des adultes attentionnés qui sont capables de faire preuve de compassion envers les patients. .
Ce programme, administré par la CSEM, offre des services éducatifs aux enfants admis à l’hôpital et ceux qui fréquentent les cliniques externes, notamment celles d’hémodialyse et d’oncologie. Les services sont offerts pour toute la gamme des situations médicales qui sont traitées à l’hôpital et couvrent des élèves de la maternelle à la 11e année qui suivent des programmes réguliers ou pour besoins particuliers. Les séjours à l’hôpital varient et ces cas incluent : oncologie répétée, fibrose kystique et transplantation d’organes; des enfants admis pour maladie soudaine ou blessures; des opérations; les patients admis pour dialyse deux ou trois jours par semaine durant la semaine scolaire. La plupart des patients sont confinés dans leur chambre et requièrent un format de tutorat. L’accent principal est mis sur l’anglais et les mathématiques. La durée du cours est normalement de 30 à 60 minutes dépendant de l’état physique de l’enfant, de ses besoins scolaires et de la charge de travail des enseignants. Les enseignants de l’hôpital sont en contact étroit avec l’école de l’enfant afin d’assurer une continuité académique. Autant que possible, le travail effectué à l’hôpital reflète celui qui est couvert dans la classe régulière de l’enfant. L’enseignement à l’hôpital requière une communication équilibrée entre le patient, le personnel médical, les parents et l’école. RETOUR À L’ÉCOLE: Si l’enfant doit retourner à l’école après un long séjour à l’hôpital, l’enseignant visite l’école afin d’assurer que la transition à la classe régulière soit aussi facile que possible. Lorsque l’enfant retourne à la clinique pour des suivis, le succès de l’intégration de l’enfant est évalué. Si l’enfant n’a pas de visites de suivi, l’enseignant de l’hôpital appelle l’école pour s’assurer que tout est en ordre (habituellement après une semaine). Afin de normaliser autant que possible la vie d’un enfant pendant qu’il est à l’hôpital, la préparation d’un calendrier scolaire journalier fera en sorte que l’enfant se sente comme un enfant « régulier » qui va à l’école et qui a des « devoirs ». En permettant à l’enfant de rester en contact avec sa classe et son enseignant (courriel, lettres, etc.) et en utilisant les mêmes outils qu’à l’école (par exemple des ordinateurs) il ou elle se sentira de plus en plus comme un enfant « normal ». Les enfants qui visitent souvent les cliniques de l’hôpital (principalement en hématologie et dialyse) apportent habituellement leur travail d’école avec eux. Lorsque des épreuves majeures de l’école ou du ministère sont administrées, elles le sont aussi par l’enseignant de l’hôpital.Les enfants qui ne peuvent pas retourner à l’école après avoir quitté l’hôpital ont besoin d’enseignement à domicile. L’enseignant de l’hôpital initie les formalités, appelle la direction de l’école et explique le processus aux parents. MOIS DE L’HISTOIRE NOIRE: Les écoles de la CSEM ont souligné le Mois de l’histoire noire de nombreuses façons. L’école primaire Nesbitt de Rosemont et l’école secondaire Rosemont ont tenu des évènements spéciaux les 11 et 17 février respectivement. Ces programmes visaient à transporter les élèves à un nouveau niveau de connaissance de soi en apportant des changements positifs à la communauté et en soulignant les belles traditions et les modèles de la communauté noire. Nesbitt a invité la juge de citoyenneté, Veronica Mae Johnson qui a parlé de l’importance d’avoir un rêve et d’unir les individus. Le danseur Justin Jackson et l’orchestre de percussion de l’école primaire Coronation et des membres de l’Académie de danse de Montréal étaient aussi présents. L’école secondaire Rosemont a invité Elysia Bryan-Baynes de Global TV, Justin Jackson, l’orchestre de percussion de l’école primaire Coronation et l’Académie de danse de Montréal. ROBOTIQUE: L’Alliance pour l’enseignement de la science et de la technologie (AEST) a annoncé que les inscriptions sont maintenant ouvertes pour le 14e concours annuel junior de Robotique. Cette année, l’évènement aura lieu au Collège Vanier de Saint-Laurent le vendredi et le samedi 29 et 30 avril. À cette occasion, il est demandé aux élèves de construire et de programmer des robots. (Lego) et de satisfaire un défi spécifique conçu pour le concours. Au cours de l’évènement de deux jours, les équipes d’élèves se font la concurrence au sein d’un environnement stimulant et motivant où ils apprennent la programmation et les habiletés de création d’équipe dans une atmosphère de bonne camaraderie. FOIRE RÉGIONALE DE SCIENCES: La Foire annuelle régionale de sciences et de technologie Hydro-Québec aura lieu du dimanche 13 mars au mardi 15 mars au campus du centre-ville de l’Université Concordia. Organisée par l’Alliance pour l’enseignement de la science et de la technologie (AEST), c’est la seconde des trois années consécutives où la Foire sera tenue à Concordia. Au cours de ce concours unique en son genre, des savants en herbe, âgés de 13 à 20 ans, présenteront aux visiteurs des projets scientifiques qui les passionnent et prouvant que la science et la technologie peuvent être intéressantes et accessibles. RENCONTRES DU CANADA: Chaque année, Rencontres du Canada – le forum jeunesse du pays – accueille des élèves de la CSEM âgés de 14 à 17 ans. Ces élèves se joignent à des adolescents d’à travers le pays au Centre de la jeunesse Terry Fox à Ottawa pour une semaine inoubliable d’ateliers bilingues, de sorties et d’évènements culturels. Ils apprennent à connaître les institutions canadiennes, rencontre des canadiens talentueux, explore des options intéressantes de carrières et développent leurs habiletés de leadership civique. Ils font l’expérience de la diversité de l’héritage et de la culture du Canada, et explorent leur propre potentiel. Plus de 100 000 élèves ont déjà vécu cette expérience! Rencontres du Canada offre un choix de 13 différents thèmes d’une semaine chacun : arts et culture, le Canada se souvient, Démocratie et jeunesse, Expérience Canada, Premiers répondants, Relations internationales, Journalisme et communications, Loi et notre système de justice, Médecine et santé, Sciences et écologie, Sciences et technologie, Sports et forme physique et Vimy : le passage pour l’autonomie du Canada. Rencontres du Canada est ouvert à tous les élèves âgés de 14 à 17 ans et près de 130 adolescents d’à travers le pays y participent chaque semaine. La CSEM offre 20 subventions chaque année avec un maximum de deux par école. Pour plus de renseignements au sujet du programme de cette année, des subventions et des inscriptions, communiquer avec le conseiller d’orientation de votre école ou Travis Hall, conseiller pédagogique, Développement de carrières à thall@emsb.qc.ca ou téléphoner au 514-483-7200, poste 7818. Pour des renseignements additionnels au sujet de Rencontres du Canada, visitez www.ewc-rdc.ca. L’enseignante Anna Persichilli du Centre d’adultes Galileo de Montréal-Nord ainsi que ses collègues et leurs élèves vivant avec des besoins particuliers, sont les plus grands partisans des Canadiens de Montréal. En réponse à la couverture médiatique négative qu’ils ont reçu suite à leurs plusieurs défaites, l’équipe de Galileo a pensé que les Canadiens avaient besoin de ressentir l’amour de leurs partisans les plus loyaux. C’est pour cette raison que Mme Anna a eu l’idée de lancer la plus grande « vague d’amour » à Galileo et d’inspirer d’autres écoles de la CSEM de les suivre et de créer la plus grande vague à Montréal. HOCKEY SANS FRONTIÈRES: L’aréna Samuel Moskovitch de Côte Saint-Luc était le lieu et le hockey était à l’ordre du jour mais ce qui s’est produit sur la glace a été un ajout après coup à tout le spectacle. Quelques centaines d’élèves aux besoins particuliers du Centre d’adultes Marymount et de l’école secondaire John Grant se sont rendus à l’aréna pour participer à leur toute première partie de hockey. « Nous avons aussi des élèves de plus de 75 pays qui apprennent le français ou l’anglais et qui n’ont jamais assisté à une partie. Leur faire partager la culture fait partie de notre travail » a déclaré Jacques Monfette, directeur du Centre d’adultes Marymount. PARTENARIAT DU CENTRE D’ADULTES JAMES LYNG: En 2012, le Centre d’adultes James Lyng a développé un partenariat avec Studio Sans Limites, un programme offert par Autisme Sans Limites. La mission de ce programme est de faciliter l’intégration sociale des adultes autistes par le biais de la formation continue, le développement d’habiletés et la formation au travail. Le Centre d’adultes James Lyng a ouvert ses portes à Studio Sans Limites en offrant de l’espace de travail et un enseignant pour travailler avec ses élèves, mieux connus sous le nom d’apprentis. Les apprentis maîtrisent des habiletés de travail, telles que l’imprimerie. L’équipe a travaillé à l’impression de logos sur des t-shirts pour plusieurs compagnies et produit un excellent travail ! Paul Fernandes, un apprenti du Studio Sans Limites du programme de James Lyng a été choisi pour représenter le Canada et participer aux 9e Abilympiques qui auront lieu à Bordeaux, France les 25 et 26 mars. L’organisation Abilympique célèbre et rehausse les habiletés d’employabilité des personnes avec handicaps par le biais de concours d’habiletés inclusives qui encouragent l’indépendance, l’échange international, l’amitié et la sensibilisation publique. Paul représentera le Canada dans la catégorie E-Sports des Abilympiques, spécifiquement un jeu vidéo qui doit être complété avec succès dans une limite de temps. Le premier concurrent qui termine le jeu remportera la médaille d’or de la catégorie E-Sports. Paul participera en compagnie de concurrents du monde entier. Bonne chance à Paul ! The next Focus will be published on March 24. Submissions should be made to Michael J. Cohen preferably by e-mail (mcohen@emsb.qc.ca) by March 18 at Noon.